Today is a bank holiday (in some places) so I thought I would talk about a recent holiday, or research trip as writers call them. When I first started writing I made up the places where events took place, I knew exactly what they looked like. Unfortunately I then tried to find the location “in real life”. It made for some interesting holidays and was surprisingly successful. However I am growing up and have started to become more organised. 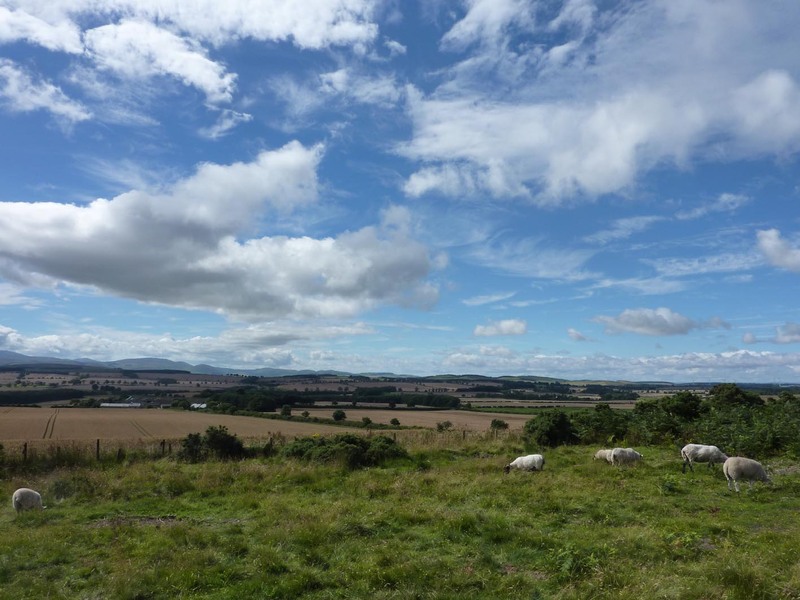 I am visiting before I write – but how useful is it? 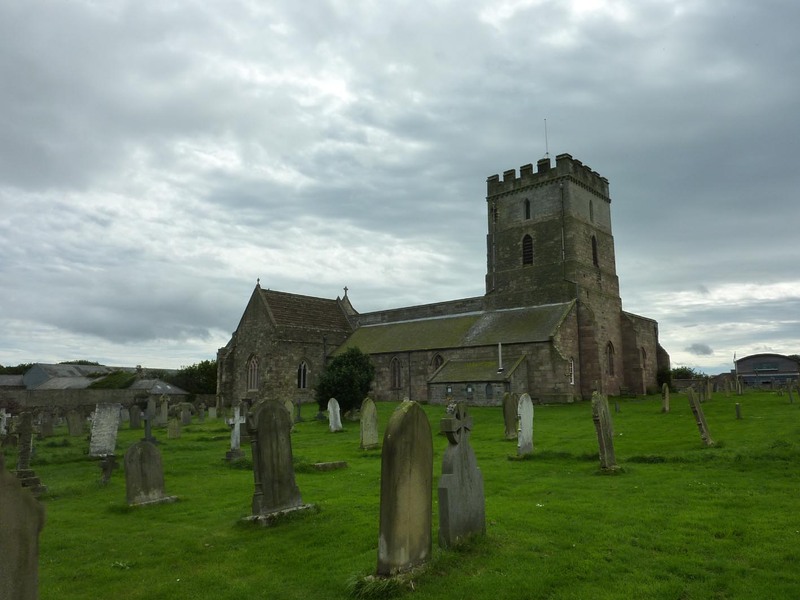 I have set part of my second book in Northumberland, at Bebbenburh (Bamburgh). The first problem was that I wanted to visit in autumn, but my husband insisted we go in August. Actually August is autumn according to the Anglo-Saxon calendar, but I was thinking howling winds and lashing rain. Perhaps I would be lucky with the weather – I wasn’t. We had the most pleasant weather imaginable; warm and sunny. 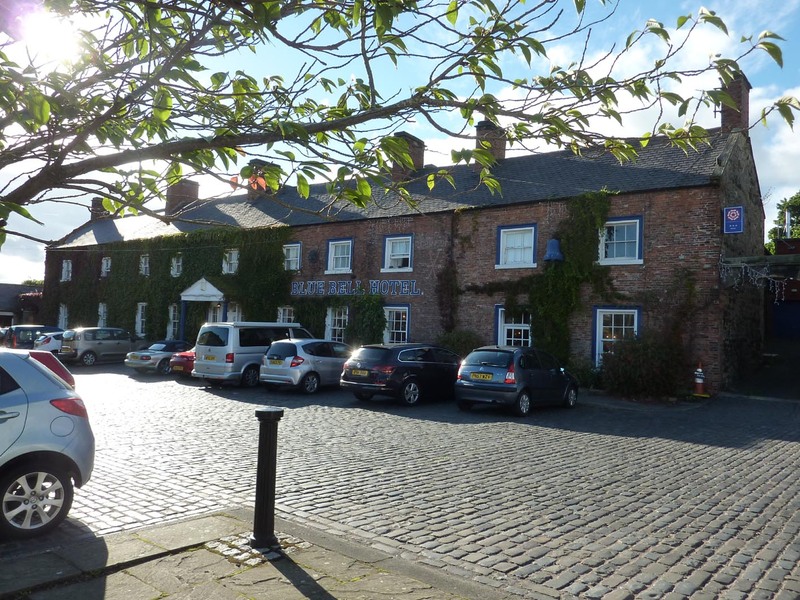 We had booked four nights at the Blue Bell Hotel in Belford. It was very comfortable and the food was good. We didn’t even need a clock as the village church was next door and struck the hour, every hour, even though the night. We had planned a walk for the next day, but it was a bit cloudy. 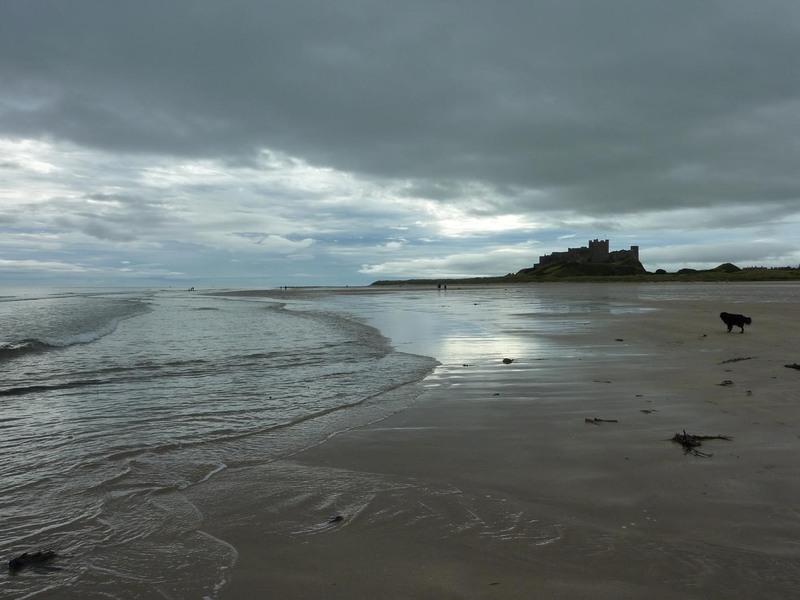 Since the forecast was for sun later, we decided to postpone the walk and drove the few miles to Bamburgh. We parked in the (free) car park and walked up to the entrance. We had explored the castle some years ago, so we intended an external circuit, for me to soak up the atmosphere. We were early and I don’t think it had opened anyway. We peered through gates until we came to a dead-end. We found a path down to the beach and the tide was out. I had a nice paddle and took lots of photos of the castle silhouetted against the dramatic sky. I started planning a scene of my hero galloping along the wide sands, with his dog. 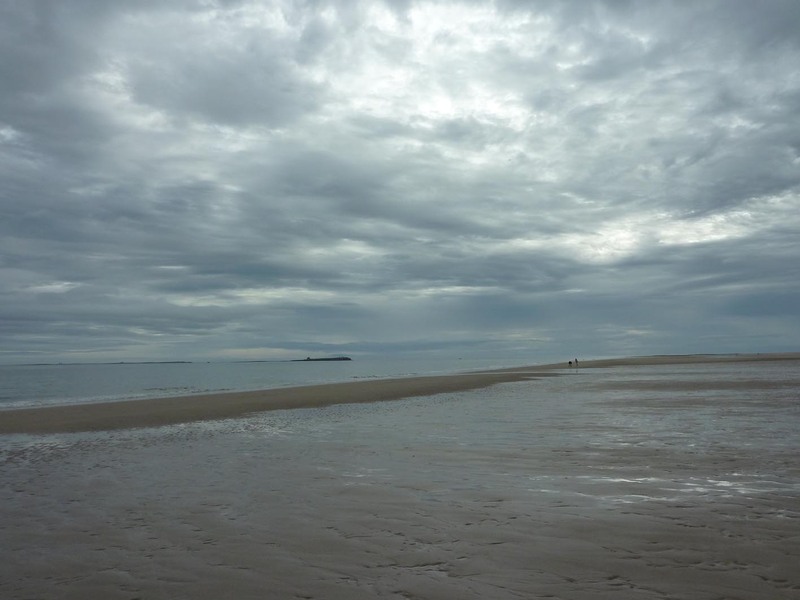 First mistake – it seems that the wide sandy beach wasn’t there at the time – scratch that scene! Of course I already knew that the castle would not have looked like it does now. It would have been smaller with a wooden Hall and other buildings surrounded by a wooden palisade. At least that is how it was originally built, but might the walls have been replaced by stone by Byrhtnoth’s time (the tenth century)? More research needed! I was sure where the entrance had been. Anyone who has read Matthew Harffy’s book The Serpent Sword (and if you haven’t, why not? 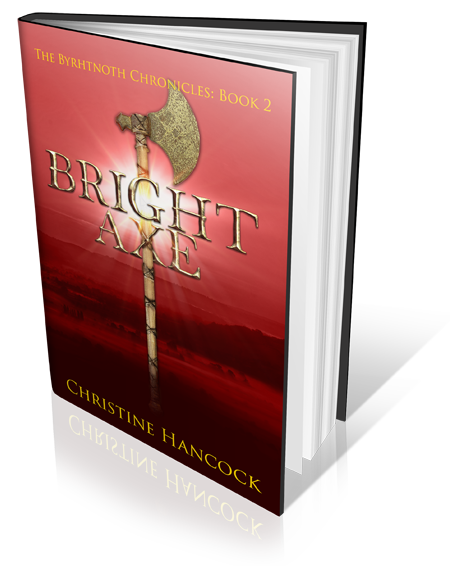 Buy it here for only 99p) will remember the opening scene of Beobrand’s arrival by ship (somewhere near the bouncy castle) and entry up the narrow steps – in wind and rain, of course! Interestingly, when I re-read that piece, I noticed that neither the width of the beach nor the composition of the walls is mentioned. A good lesson. If you don’t know the answer, leave it to your readers to imagine it – if they get it wrong it is their fault, not yours! 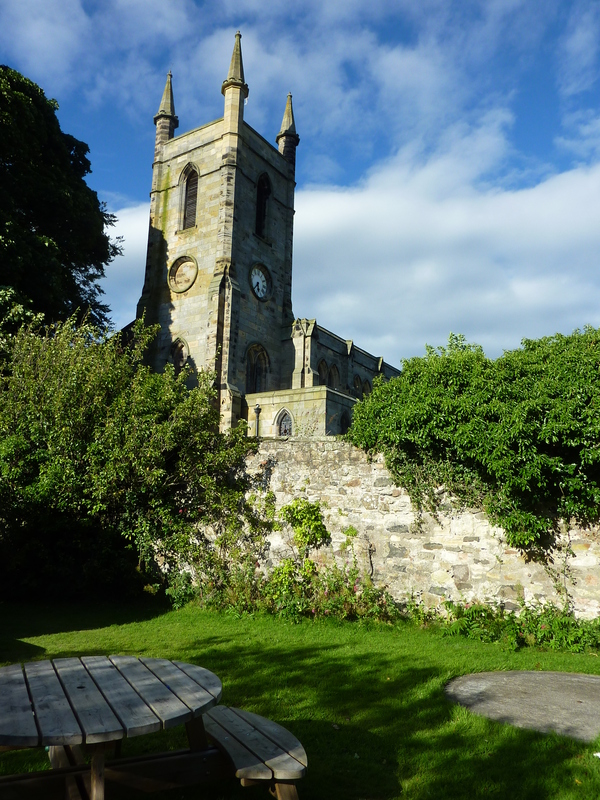 After a coffee and a toasted teacake at the Copper Kettle Tearoom in the village, we visited the local church, originally founded by St Aiden in 635, the first church to be built in Northumbria. 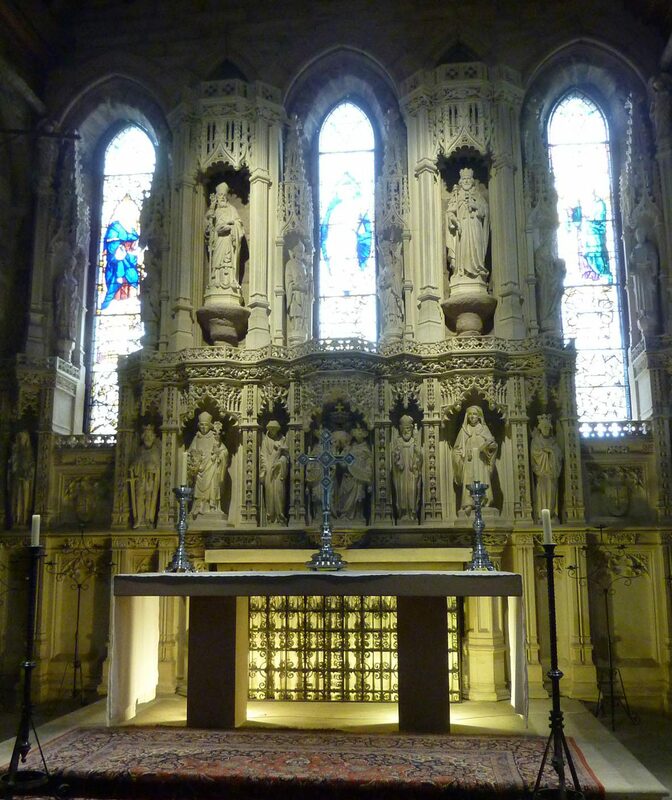 The reredos, which dates from the end of the 19th century contains images of many Northumbrian saints. As we left Bamburgh the sun came out. We headed inland to start our planned walk. 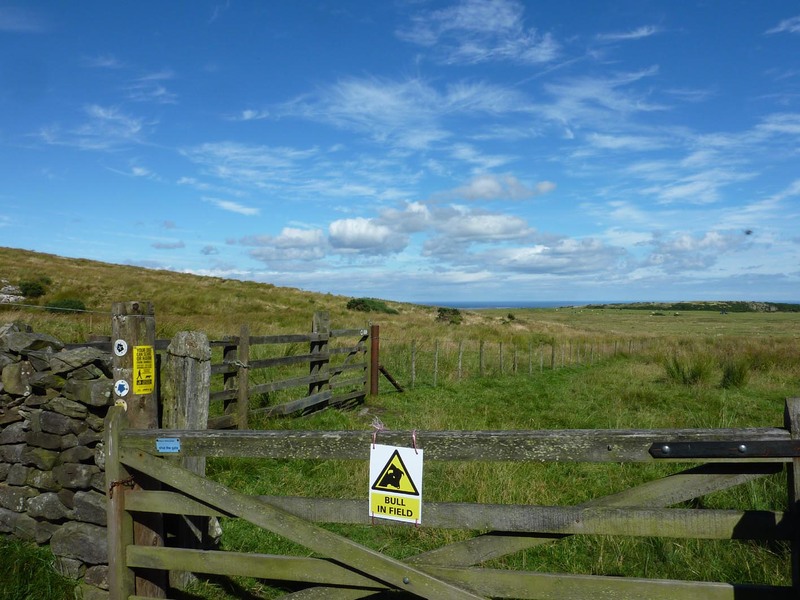 We had found a suitable walk online to St Cuthbert’s Cave and round the surrounding area. 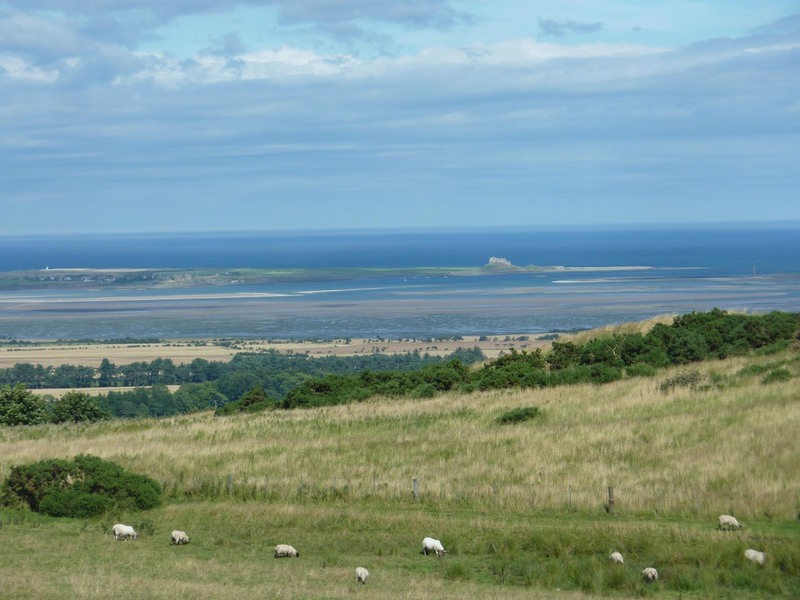 It included part of St Cuthbert’s Way, a long distance footpath from Melrose to Lindisfarne marking events in the life of St Cuthbert. 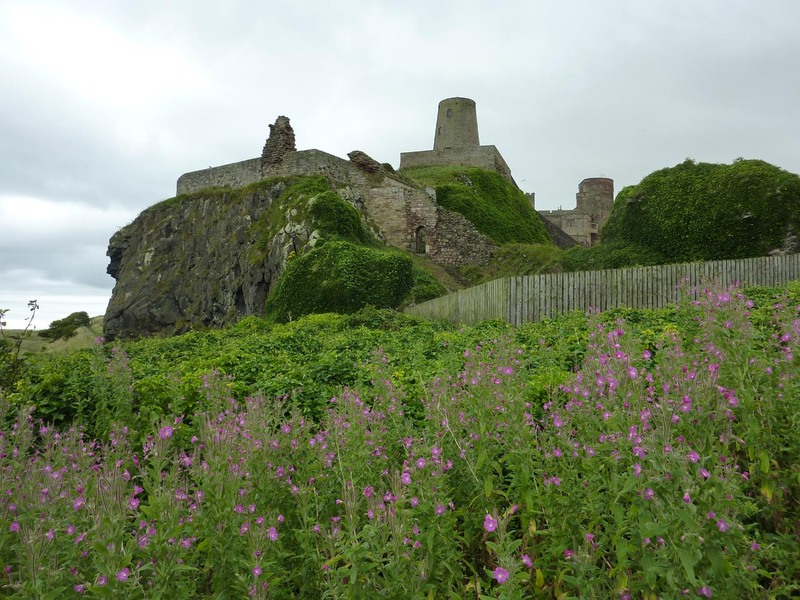 The cave is supposed to be the place where monks carrying the body of the saint rested on their journey from Lindisfarne Abbey after it was raided by Vikings in 875. The bones eventually arrived in Durham several years later. Owned by the National Trust – spot the error! “Pass through this gate and then the gate on your left” Would you? We did – quickly. 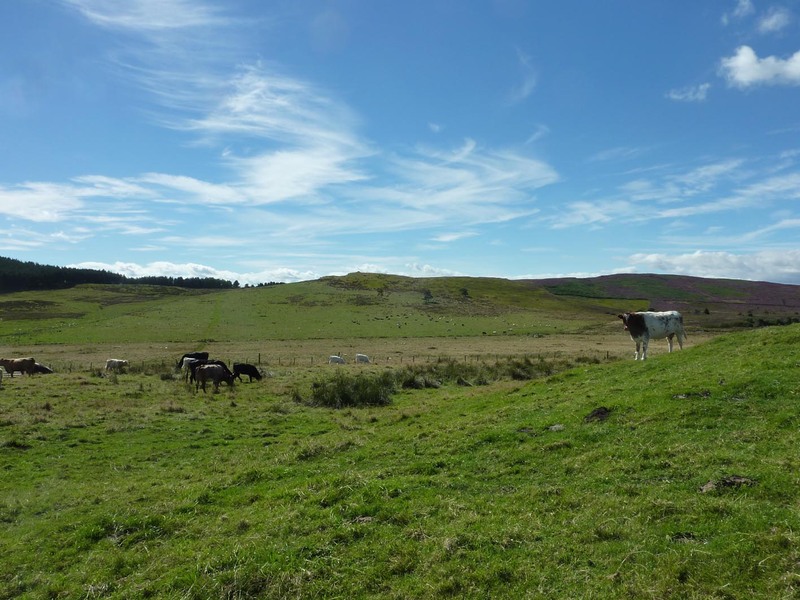 The next field had cows and calves. We walked very slowly, under intense observation. After the walk, we returned to our hotel. It had been a long day and there would be another tomorrow. I loved this post. It’s amazing how much you can get from a visit. Thanks for the mention too! Unfortunately I haven’t visited many of the places I mention, hence my trick of not included unnecessary details (which I am amused to find you noticed!). I do the same with everything – try to leave as much as possible up to the reader, who is inevitably better at imagining than I am at explaining! 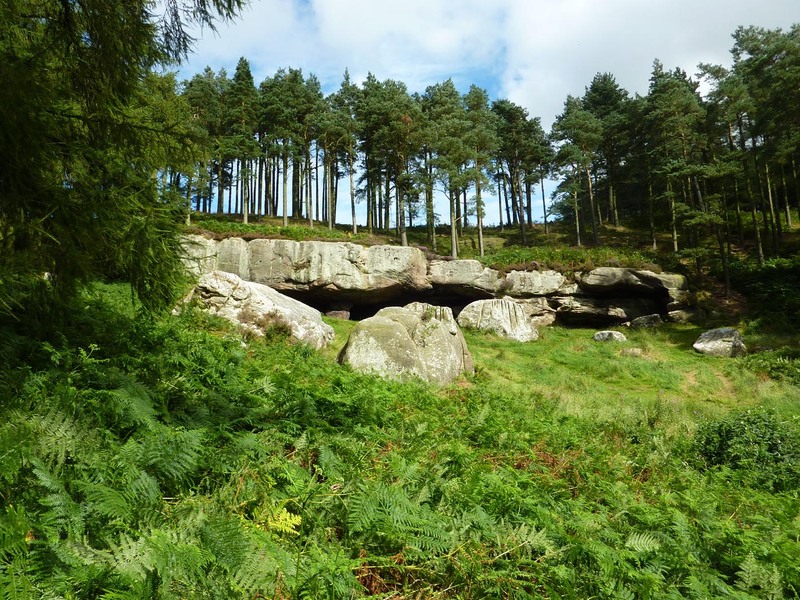 By the way, had you noticed that Cuthbert’s Cave is where Beobrand and his merry band shelter from the rain whilst on their way to Ubbanford for the first time in The Cross and the Curse? I hadn’t noticed that. I’ll have to re-read it. Can you guess where else I went in the area? More tomorrow, or the next day. I loved this post. And thanks for the mention too! It is amazing how much you can get out of a trip to a location. Unfortunately, I haven’t been able to visit many of the locales in my books, so I leave out unnecessary details. It amused me that you noticed this particular “feature” of my writing. Readers will inevitably be better at painting a picture with their imaginations than I will be able to write a description. By the way, had you worked out that Cuthbert’s Cave is where Beobrand and his merry band shelter from the rain on their way to Ubbanford for the first time in The Cross and the Curse? Really atmospheric photos. And I loved the point you made about readers filling in gaps. We all do it and I am often convinced I’ve read a description in a novel which isn’t there. It is also fascinating when readers complain about something an author has put in which is purely in the reader’s imagination and not on the page at all. Set designers say that they just need to put on stage enough of an outline to suggest a landscape or interior and the audience will fill in the detail. I guess that’s also true of authors. Can’t believe you visited, clearly on a day I was there as well. 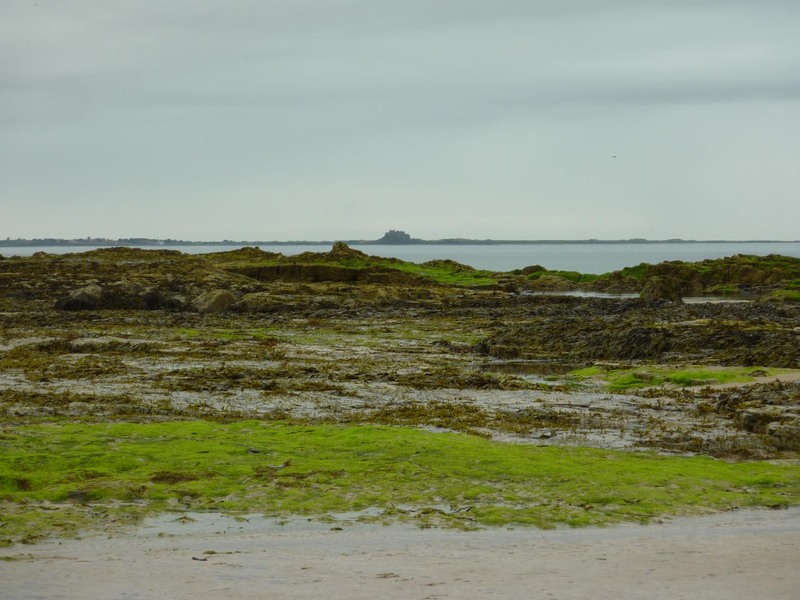 The bouncy castle was very atmospheric at Bamburgh Castle (not!). 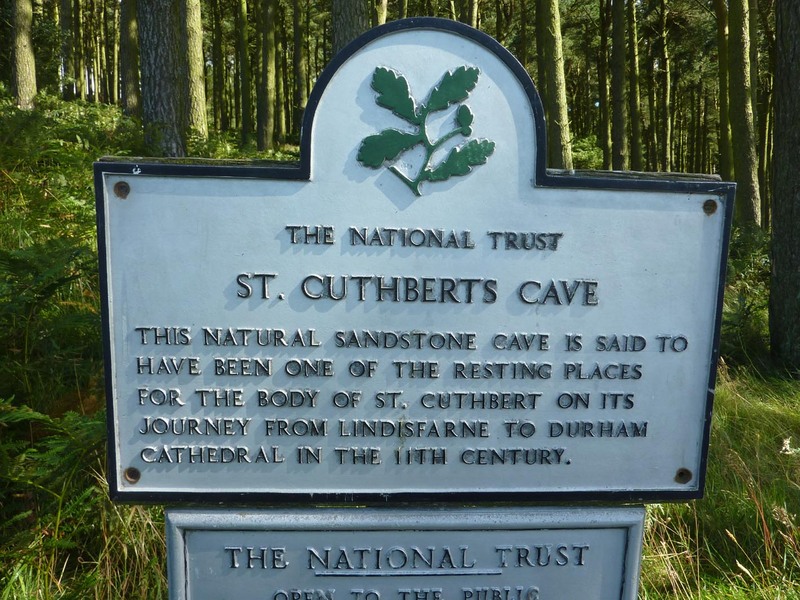 We tried to find the ‘other’ St Cuthbert’s Cave last year but gave up because I’m not a goat and my ankles can’t take walking on a slope for that long. Instead we watched a farmer trying to force a mummy sheep and her lambs through a gate whilst not allowing the ‘other’ sheep who wanted to steal her babies through. It was frustrating even from a distance! !